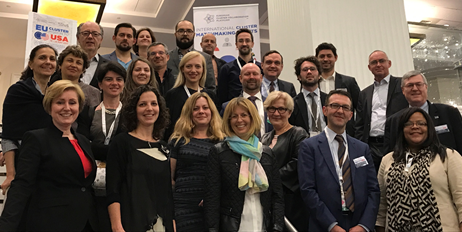 Home > News > High-level mission to the U.S. and cluster matchmaking event: opening research and innovation collaboration opportunities for European clusters and their members! 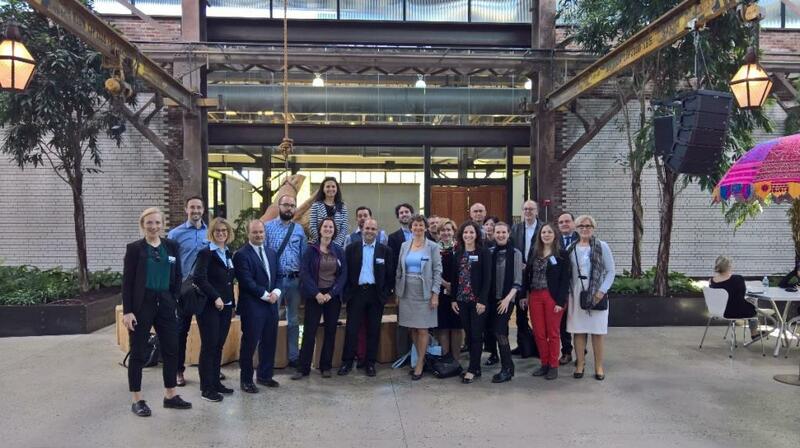 From the 15th to the 19th of May 2017, a delegation visit of 19 European cluster organisations from 10 EU countries to the United States (U.S.) was organised by BILAT USA 4.0 www.euussciencetechnology.eu and the European Cluster Collaboration Platform (ECCP) www.clustercollaboration.eu. The Mission was organised following an open call for participation. The full-week event was highly appreciated by the participants who were able to enroll in a rich programme with over 20 visits to cluster-like organisations in Philadelphia (PA), Boston and Cambridge (MA). 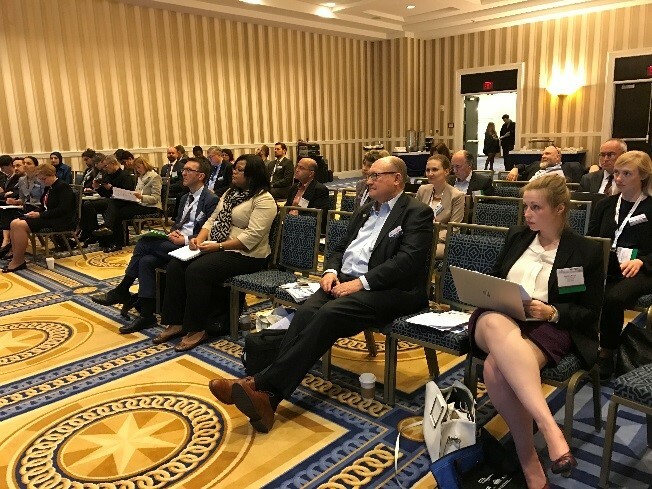 In addition, the participants presented their activity and the research and innovation (R&I) stakeholders they represent in more than 90 bilateral/cluster to cluster (C2C) meetings during a matchmaking event with 13 U.S. counterparts in Washington, DC. The TechConnect World Innovation Conference & Expo on 16th of May 2017 was the opportunity to gather further insights on the U.S. industry. The business trip enabled also to learn from peers and exchange with experts during a seminar & roundtable organised during the conference. The European delegation was comprised of 19 cluster organisations in the fields of nanotechnologies, advanced materials and manufacturing, energy and sustainability, electronics and biotech seeking cooperation with clusters and the stakeholders of the R&I ecosystem in the United States. The delegation was accompanied by Christophe Guichard, European Commission Official at DG Internal Market, Industry, Entrepreneurship and SMEs (DG GROWTH) in charge of cluster internationalisation, and it was supported by the U.S. Administration through the Department of Commerce, USA. The EU delegation firstly visited Philadelphia, PA, on the 15th of May 2017, welcomed by the Economic Development Agency (EDA) Philadelphia Regional Office and the Philadelphia Industrial Development Corporation. Delegates met some of the main economic development, research and innovation actors, such as Ben Franklin Technology Partners of Southeastern Pennsylvania, Life Sciences Pennsylvania, Science Center, Penn State, The Wistar Institute of Anatomy and Biology and the Singh Center for Nanotechnology. 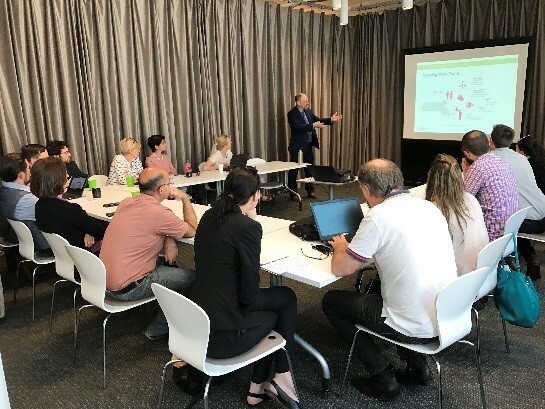 A presentation of the local research and innovation ecosystem and the collaboration opportunities for the European organisations were at the heart of the discussions. The European delegation appreciated the “discovery of Philadelphia’s and Pennsylvania’s life sciences hub”. 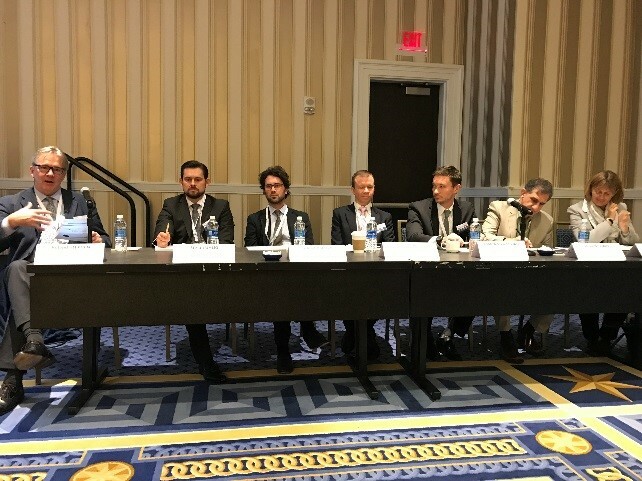 On the 16-17th of May 2017, the European delegation attended the TechConnect World Innovation Conference in Washington, DC. On 16th of May a cooperation seminar and knowledge-sharing round table was organised to present experiences on existing EU-U.S. cluster collaboration and to exchange on good practices. The presentations included an overview of the U.S. R&I ecosystem in comparison to the cluster landscape in the EU which enabled the clusters and the audience to share a common understanding on cooperation opportunities. The seminar and roundtable were followed by a half-day matchmaking session to which 13 U.S. cluster-like organisations were invited to meet with the European delegation. Some 90 bilateral EU-U.S. meetings took place between clusters and research and innovation organisations. 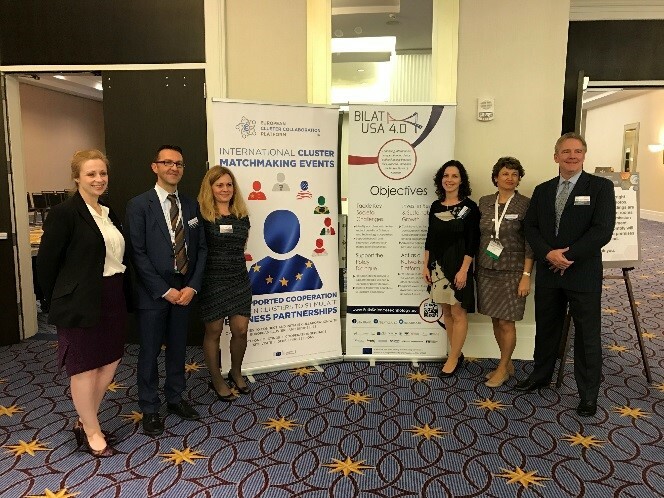 A number of EU participants were able to share concrete ideas for collaboration with their U.S. counterparts either as a cluster organisation or on behalf of their members. The 17th of May was dedicated to the participation at the TechConnect World Innovation Conference which offered sessions both on scientific and business & innovation related topics. The following days (18-19th of May) were dedicated to the visits in the lively tech and innovation hubs of Boston and Cambridge, MA. Massachusetts is living up to its reputation as the “Leading Technology State” in federal expenditure for academic and non-profit R&D in the U.S., and one of the global leaders in biotechnology, clean energy, digital health, IoT and some other topics. The EU clusters were hosted by U.S. organisations active in the same fields and interested in research and innovation cooperation. In total, the European delegation had 12 top-quality meetings with intense exchanges – e.g. at the Massachusetts Institute of Technology (MIT) Center for Biomedical Innovation, the MIT Innovation Initiative, the Fraunhofer Center for Sustainable Energy Systems and the Fraunhofer Center for Manufacturing Innovation, as well as the NorthEast Clean Energy Council, the NECEC Institute, Mass Technology Leadership Council, Inc., and some others. The participants appreciated the possibility of meeting with representatives of the local innovation ecosystem, ranging from research-oriented institutions to incubators and investors, as well as technology umbrella organisations. Direct contacts have likewise been made in the informal setting at the Venture Café, organised by Cambridge Innovation Centre on Thursday evenings. It was the opportunity for the EU participants to be introduced to local entrepreneurs, start-ups, scientists and stakeholders of the dynamic ecosystem. One of the main objectives of the High-Level EU Cluster Mission to the U.S. is to support transatlantic cluster cooperation for strategic business partnerships building upon the EU-U.S. Cooperation Arrangement on Clusters signed between the U.S. Department of Commerce and the European Commission's DG GROWTH in April 2015, and to support European cluster organisations in the internationalisation of their and their members’ activities, specifically focused on business cooperation, research and innovation. Carlo Kraskovic, Project Manager, Mare FvG, Italy: “The mission has represented a great opportunity to getting aware about innovation and technology development framework in the USA, providing information on several actors with different competences and roles. Since our cluster is involved in the maritime technologies sector, during the matchmaking event we had the possibility to meet three American cluster focused on different maritime and marine topics. The before mentioned meetings helped us understand what they do and gave us the possibility to get more details on maritime topics that we could develop in the future."